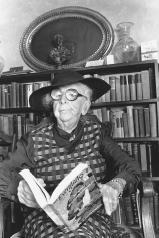 Marjory Stoneman Douglas, until her death at 108, remained devoted to environmental activism to protect and restore the Everglades. Here she poses at age 96 with her best-known book. From sunrise discoveries of the Florida Everglades in the early 1920s to promoting a national park, Marjory Stoneman Douglas informed Americans and the world of the splendor, uniqueness, fragility, and importance of this region—the only subtropical wetland in the United States. Douglas was the pen and the voice of South Florida's environmental movement. Her book The Everglades: River of Grass is the preeminent work on the subject. Published the same year that Everglades National Park was dedicated (1947), Douglas's work articulates the workings of America's unique subtropical ecosystem. The greater Everglades ecosystem stretches from above the headwaters of the Kissimmee River near Orlando south to the end of the peninsula and encompasses from one-third to more than half the state's width. Douglas recognized that the flow of fresh, clean water sustained huge bird and fish populations, unique plant communities, and endangered species. Had Douglas simply described the natural environment, The Everglades would have been a beautiful book. Her inclusion of the social environment (the people, politics, and money) of the region elevated the work to one of historic importance. In The Everglades, Douglas wove together the water, grass, rock and muck, animals, and people of South Florida. She was not the first to recognize the relationship of water to the environment, but she eloquently described the "river of grass." Douglas was one of the first writers to document the fact that the Everglades is not a swamp but a broad, shallow wetland and waterway spanning an area about 160 kilometers (100 miles) wide and 320 kilometers (200 miles) long. Whereas her written words captivated readers, her spoken words invigorated listeners to action. In 1970, Douglas organized and led the Friends of the Everglades citizens' action group, which by 2000 had grown to more than six thousand members and is an influential player in all environmental issues affecting the Everglades ecosystem. Douglas was born April 7, 1890, in Minneapolis, Minnesota. She grew up in a house of adults, separated from her father. Because of her mother's mental illness, she lived with her maternal grandparents and aunt. Graduating in 1912 with a degree in English literature from Wellesley College, Douglas was named class orator. Soon after Douglas's graduation, her mother died, and Douglas was free to be independent, but lacked direction. For 3 years she wandered through a series of department store jobs; relocations to Boston, St. Louis, and Newark; and a failed marriage. In 1915, she reunited with her father in Miami. Except for 2 years (1918 to 1920) she spent as a Red Cross worker in Europe, Douglas experienced and documented South Florida's explosive growth and the environmental consequences of that growth over the course of 80 years. Transition to Writing and Leadership. Above all, Douglas aspired to be a writer. Beginning with essays in high school, she moved on to a career as a journalist and assistant editor with the Miami Herald and as a freelance writer. She produced thirteen novels and books of short stories, hundreds of newspaper and magazine articles, three plays, poems, and numerous contributions to other authors' works. Acknowledging that The Everglades was her best work, Douglas felt that her single most important accomplishment was achieved through poetry. Her oratory skills served Douglas well. Considered bookish, she was also confident and outspoken. Douglas was a women's rights, civil rights, and human rights activist long before completing her legacy as an environmental leader. She urged the Florida legislature to pass the women's suffrage amendment, and she began speaking out on issues, especially about the Everglades. By her own admission, she would talk at the drop of a hat, often telling listeners more than they may have wanted to know. She lectured, cajoled, scolded, and inspired public officials, farmers, ranchers, developers, and everyday citizens. Challenged to do something more and believing in the power of organizations, Douglas founded the Friends of the Everglades. Initially begun to defeat a proposed Everglades jetport, the group continues to epitomize Douglas's belief in action, that each individual citizen has to do something. Through her writing, Douglas gave a forum for scientists to describe how draining the Everglades, interrupting the sheet flow of water with roads and canals, and channelizing the Kissimmee River changed the Everglades. She gave a remote, often harsh environment a personality; explained the basic science and processes; and bluntly pointed out the effects of altering the environment. In addition, she provided others with a vehicle to explain the importance of the system's hydrological cycle, sheet flow mechanics, surface-water runoff, and soil subsidence and to make the necessary scientific case for restoring the natural systems. Pioneering Everglades environmentalist Art Marshall told Douglas that with three words ("river of grass") she had changed people's perceptions and also educated the world about the true nature of the Everglades. Douglas died May 14, 1998, in Miami, Florida at the age of 108. She was cremated and her ashes were spread over the Everglades. SEE ALSO Everglades ; Florida, Water Management in . Breton, Mary Joy. Women Pioneers for the Environment. Boston, MA: NortheasternUniversity Press, 1998. Byers, Stephen W. "Don't Mess with Her Wetlands." New York Times Magazine v. 6(1999):46–47. Douglas, Marjory Stoneman. The Everglades: River of Grass. 50th Anniversary Edition.Sarasota, FL: Pineapple Press, 1997. Douglas, Marjory Stoneman, and John Rothchild. Voice of the River. Sarasota, FL:Pineapple Press, 1987. Marjory Stoneman Douglas Page. Friends of the Everglades. <http://www.everglades.org/msd.html> . A prolific writer, Douglas contributed many books about Florida, the Everglades, and the environment. Among her books are: Alligator Crossing: A Novel (1959); Florida: The Long Frontier (1967); Joys of Bird Watching in Florida (1969); Adventures in a Green World: The Story of David Fairchild and Barbour Lathrop (1973); Freedom River (1994); and River in Flood, and Other Florida Stories (1998).